Publisher: Joseph Crosfield & Sons, 1962. Soft Cover, 112 pages, 8.25 x 10.00. 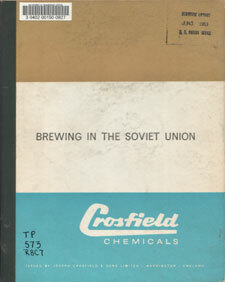 An unusually in-depth look at brewing in the Soviet Union from the 1940s through 1962, when this booklet was published. Mostly technical explanations of Soviety brewing methods, specs of Soviet brewing equipment, the major Soviet beer styles, demographics of Soviet breweries, and Soviety beer production and consumption statistics. Highly unusal information compiled from Soviet sources by the Joseph Crosfield & Sons, Ltd., Warrington, U.K, in 1962.